The two sons of Daigo may be meeting face to face for the very first time, but of course neither of them knows that, so their interactions don’t go too far beyond Dororo and Hyakkimaru’s usual dealings with people: kill a demon, collect a reward (and a handsome one at that). Hyakkimaru does, however, take an extra-long look at Tahoumaru’s soul: it’s “clean”, with no hints of red people get when they’ve killed another human. 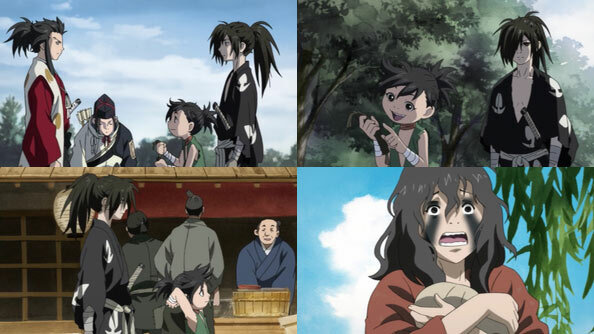 Dororo and Hyakkimaru enter Daigo’s prosperous trading town and, after travelling around the sticks for so long, are positively overwhelmed by the sheer amount of sights, products, and activities. But someone spots them: a very disheveled woman who despite appearing like a lunatic to everyone around her actually has it exactly right: the “demon child” is alive. While watching a play depicting Lord Daigo’s victory over the demons (ironic considering he actually struck a deal with them) Dororo spots Biwamaru, who sad to hear the news of what happened to Mio and the orphans. He’s there to check out what we know of as the Hall of Hell, where the Demons Daigo is believed to have defeated dwell. Hyakkimaru overhears (now that he hears and all) rumors about the “curse of Banmon” being to blame for the lack of rain lately (little do the townsfolk know the reason is actually Hyakkimaru). 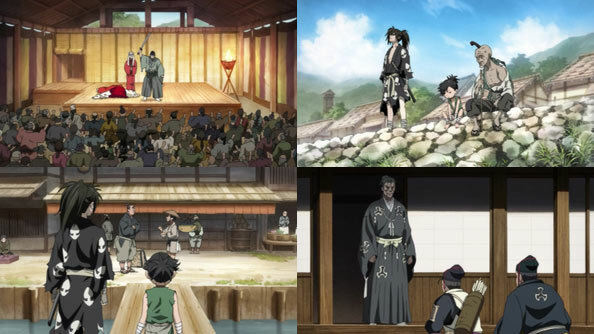 Meanwhile, Hyougou and Mutsu report their encounter with a young lad with prosthetics and a small boy boasting that they’re high-level demon hunters. Needless to say, Daigo is concerned. 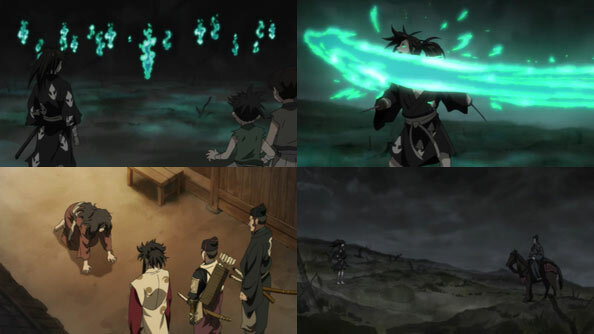 Dororo and Hyakkimaru pay a visit to the “Banmon”, the last survivng segment of a wall that was breached and destroyed by Daigo’s armies in his victory over Asakura. A young lad named Sukeroku is trapped on the wrong side of the border between the warring clans, and just wants to get back to his fam. He feeds Dororo and Hyakkimaru, so they agree to help him out. Daigo informs his wife Nuinokata that their firstborn has most likely returned to their lands. He’s determined not to let anything, including him, spoil his prosperity. When Nuinokata voices her concerns that the two of them are going to properly pay for what they (really he) did to their son, Daigo dismisses her, making a remark about women “not knowing anything about politics.” Tahoumaru overhears everything, only increasing his curiosity. Once the Asakura sentries call it a night, the site of the Banmon becomes a battlefield between Hyakkimaru and an ever-replenishing number of angry fox spirits, who eventually combine into one massive demon fox, or kyubi. He’s about to be overwhelmed when a volley of arrows hastens its retreat. 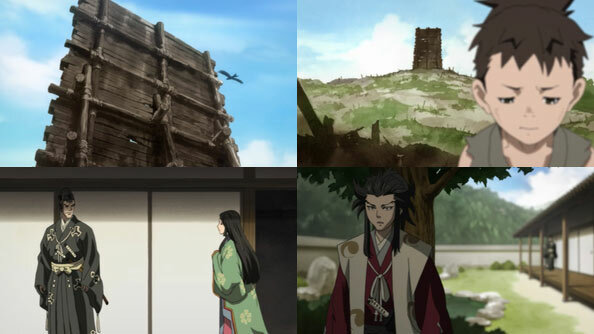 Just as Tahoumaru and his aides find the “crazy” woman in town, who is one of the midwives present for Hyakkimaru’s birth and knows what they did to him, Hyakkimaru is confronted by those who fired the arrows: the entourage of no less a person than Lord Kagemitsu Daigo himself. For the first time since his birth, the firstborn and his father are finally face-to-face. I wonder if Tahoumaru will have something to say about what should be done with Hyakkimaru; considering what we’ve seen of him, it doesn’t seem like he’d hold his brother’s very existence against him considering what was done to him. But if he’s to adopt a sympathetic position regarding Hyakkimaru, he’ll be defying his lord father.